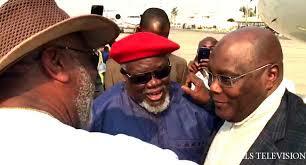 Atiku lands in Abuja after US visit – Royal Times of Nigeria. While in Washington D.C., Atiku met with some Nigerians and participated in a business roundtable at the US Chamber of Commerce. He also held discussions with some Nigerians living in D.C. metropolis where he revealed his plans and commitment to working with them to ensure the development of Nigeria if elected president. He had reiterated his commitment to the devolution of powers at the centre, thereby allowing for a smaller, and more effective Federal Government. 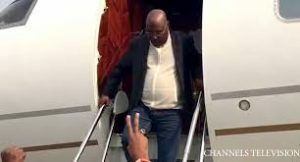 Upon his return to the country, the PDP candidate is expected to participate in a presidential debate organized by the Nigeria Elections Debate Group and the Broadcasting Organisations of Nigeria. The debate holds by 7:00pm in Abuja.